As you know I wear a million hats. Host, Style Expert, Beauty Expert, Blogger, Emcee, Fashion Writer etc… I have been working with Red Carpet 101 for a last few months dishing out all thoughts on all things on the red carpet. Grammys, Sundance, Oscars, Best of the Week- you name it! I didn’t want to inundate you with my posts nonstop so I thought I would dedicate a blog to some of my favorite segments. Enjoy! We have some really great writers on this site and invite you to check everyone out. Follow RC 101 on Instagram, Facebook and Twitter. You can get a double dose of Loftiss! Let me know what segment you like best! 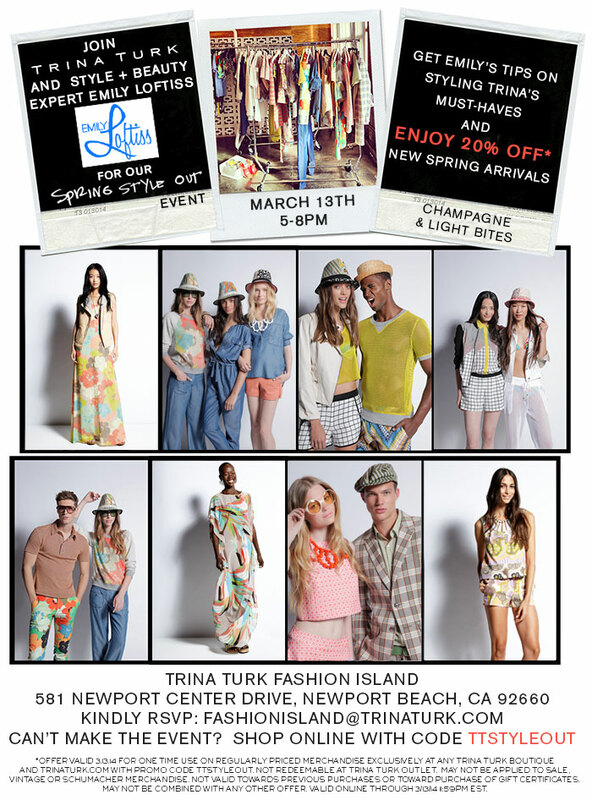 I am partnering with Trina Turk this Thursday for their Spring Style Out Event. I will be at their store in Fashion Island from 5-8 offering style advice on how to create incredible looks. PLUS you receive 20% off the latest spring items! WHAT!!!! !I have been a huge fan of Trina’s for years and even interviewed her several times at New York Fashion Week. All my OC and LA friends I hope to se you this Thursday. And don’t forget to RSVP. Next week look forward to pictures from OCFW and this incredible event with the Trina Turk store. Have a lovely Week! Tags: celebrity, celebrity fashion, celebrity red carpets, Fashion, fashion event, Fashion Expert, fashion island, instagram, OC, ocfw, orange county, orange county fashion week, red carpet, Red Carpet 101, style, style expert, Trina Turk. Bookmark the permalink.